The 2013 Mercedes-Benz SLK 55 AMG follows a delicious design recipe. It's compact, rear wheel driven and has a strong engine but isn't stupidly powerful. It's a convertible but with the practicality and visual appeal of a solid roof. On paper it sounds excellent but there's just one thing I can't wrap my head around: At about Rs 1.5cr on-road Mumbai it edges dangerously close to entry level supercar territory. The question is: can this car be as much of an emotional and exciting machine as the other vehicles that exist at this price point? 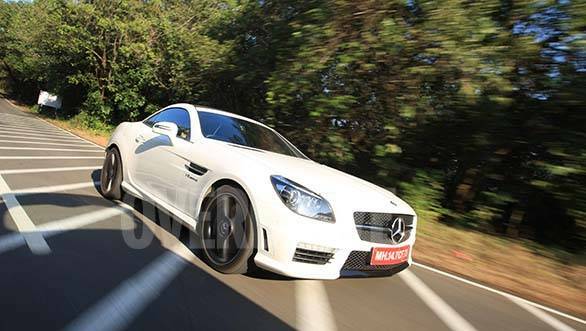 At about Rs 1.5cr on-road Mumbai, the Mercedes-Benz SLK 55 AMG edges dangerously close to entry level supercar territory. The old SLK was a bit of an effeminate design but the current gen model changed that significantly. The 55 AMG looks even more macho in this shade of white with black detailing all around. The head and tail lamps are blackened out and the car gets a smart new LED DRL strip. The matt black 18-inch wheels look great and look cleaner for longer because brake dust simply doesn't show on them. At the rear you get a new diffuser with four hot looking AMG tail pipes. 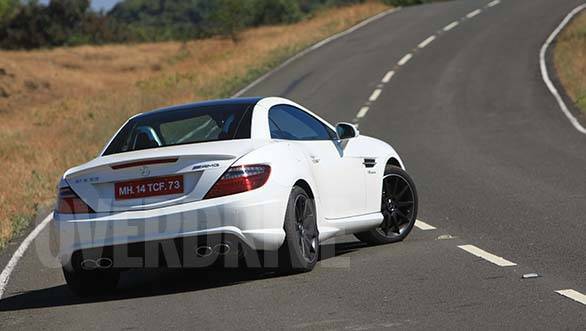 A subtle spoiler on the boot rounds off the changes over the standard SLK 350. After the relatively easy ingress the first impression is that the interiors look fittingly sporty. The sports seats are spacious, supportive and comfortable at the same time and are trimmed in a deep shade of red. The red leather trim extends to the doors and you also get a smart carbon fibre finish on the centre console and door trim. However, look more closely and you'll notice that the entire centre console, gear selector included is almost identical to what you get on an older C-Class and that dilutes the exclusive feel this car should have. Nevertheless, there are some smart touches like the movable wind deflectors behind the seats and the air scarf system that blows hot air around your neck to keep you warm when you have the top down on colder days. The sunroof also gets Merc's funky Magic Sky Control tech that at the touch of a button turns to a translucent blue to block out excessive light and heat. The head and tail lamps are blackened out and the car gets a smart new LED DRL strip. AMG cars are almost always dominated by the engine and the SLK 55 AMG gets an absolute masterpiece. 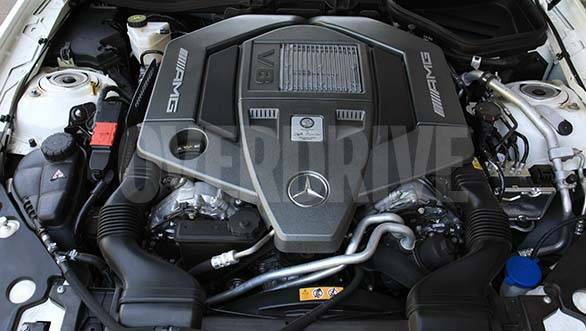 The engine displaces the same 5.5-litres as the bonkers 570PS E63 AMG but where that car uses a twin turbo set up this engine is naturally aspirated. 421PS of peak power is produced at 6800rpm and there's 540Nm of twisting force available at 4500rpm. It also comes with AMG Cylinder Management technology. This essentially shuts off half of the cylinders when the car is under very light load, turning it into a much more efficient four-cylinder motor. Couple this with Start-stop tech and Mercedes claims an overall efficiency of close to 12kmpl. That's impressive but we were far more interested in how the car performs when you put your foot down. It's obviously fast and even without the option of launch control it shot to 100kmph from a standstill in 5.4 seconds. Top speed is limited at an ample 250kmph. More importantly though, it sounds like a proper AMG. The V8 burbles at idle and bellows at the redline all while making deliciously quick and aural rev matched downshifts. Transmission duties are handled by the 7-speed AMG SPEEDSHIFT PLUS 7G-TRONIC auto box. Keep it in Sports mode and it will shift for you but the best way to drive the car is to stick it in Manual mode and shift using the paddles. Downshifts arrive quickly but upshifts have an irritating delay. You have to remember to shift about 500rpm short of the redline otherwise the car will over-rev into the limiter which slows your momentum for about a second before the next gear is engaged. The interiors look fittingly sporty. 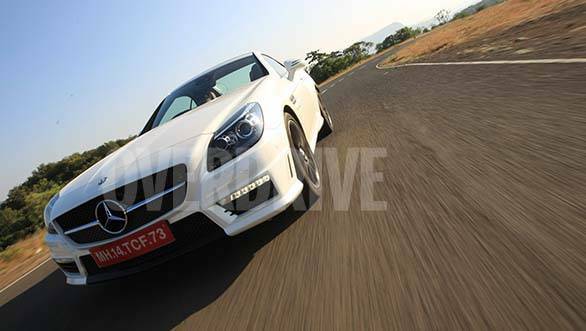 The SLK 350 was already a sharp handler and the AMG version only improves on this. Steering feel is sharp, direct and offers decent feedback without getting upset by bumps or following discrepancies in the road. The car uses large 360mm discs and 4-piston calipers up front while the rear gets a single piston caliper biting on a 330mm disc. Braking performance is strong and the car came to a dead stop from 100kmph in just 38.6m. Ride quality is also supple in town with no bone jarring thuds through potholes. The car has usable ground clearance and we had no issues with the underbody scraping. This and the compact, albeit wide dimensions and reasonably comfy ride make it easy to live with on a daily basis. The car is at its best when driven at 7/10ths where both the driver and car are in the sweet spot. Brisk top down motoring in the SLK 55 AMG through the hills with that snarling and crackling V8 sound track is a joy that's very hard to match. In terms of driving pleasure the SLK 55 AMG is right up there. It's a very accomplished roadster, an exciting handler and has an exquisite soundtrack. It also has plenty of unique creature comforts that you won't find anywhere else. However the pricing has me struggling to make sense of this car's positioning. If I was in the market for a car at this price I could have a Porsche Boxster S that offers similar performance, gorgeous styling and a superior handling package and I'd still save well over Rs 30 lakh. If it's a V8 engine I must have, the more powerful Audi RS5 retails for about not much more than the Boxster. For about the same price as the Merc I could even have a base rear engined 911 Carrera which may produce less power but happens to be one of the most iconic and evocative sports cars available today. It's these very compelling options that make the SLK 55 AMG a great car but not a very strong a buying proposition.